By now most New Year’s resolutions related to healthy eating are a bust, the weather is cold, and we have comfort food on the brain. Cooking is difficult after a hard day of work, especially when you’re mentally fried and your feet are tired. Forget spending money on take-out and eating unhealthy food at restaurants; learn how to have food on hand and eat at home through the winter months. Canning – Canning season doesn’t have to be over just because the growing season has ended. Take a few hours on a slow weekend to make a huge pot of soup and can it for future meals. Canned soup has pulled us out of many mealtime predicaments in the past. “There’s nothing to eat,” is not a phrase that can be uttered in this household anymore. Use things you canned months ago to throw together a healthy stew, spaghetti sauce, or vegetable casserole. Make extra – When you manage to muster the energy and have ingredients to cook at home you might as well channel your energy to make larger amounts of food that can be eaten later. If you have picky eaters in your family who won’t eat leftovers, put a new spin on the dish for the next night. Use taco meat for taco salads, enchiladas, or nachos. Extra chicken can be sliced up for chicken fajitas, used in a casserole, or made into simple chicken salad sandwiches. Use your creativity and your family might not even catch on to what you’re doing! If your creativity is stifled when it comes to leftovers, throw the extras in the freezer and enjoy them in a few weeks. Freeze – I am a self-declared freeze-aholic. Our freezer is packed with food that can easily be thawed and warmed or thrown into a large pot of yummy something-or-other. Matt and I can be lazy cooks sometimes, so we rely on our freezer foods at least a few times per week. Our freezer contains lots of homemade baked goods including stacks of pumpkin pancakes, tortillas, perogies, healthy whole wheat chocolate chip cookies, and pie crust. I also stock black beans, 35 pounds of blueberries we picked last summer, large blocks of butter, cheese, small bags of squash and pureed pumpkin, strawberries, freezer jam, bulk amounts of grass fed beef, whole chickens, mashed potatoes, pizza sauce, taco meat, bread crumbs, corn, and the list goes on! (You guessed it… we have an extra freezer, and they’re all homemade.) Many of these things ended up in the freezer because we decided to double a recipe, or put leftovers in the freezer before we got sick of them. 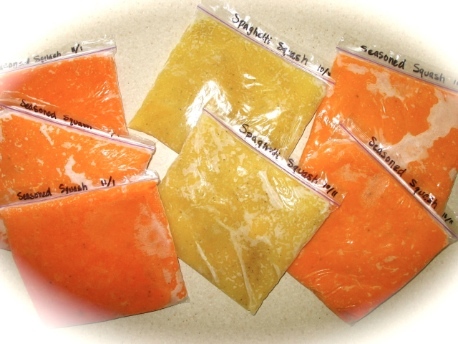 Just be sure to label freezer foods well so they do not become mystery items or out-of-date. A few of the things we froze when fall produce was coming out of our ears. Buy in bulk – Another great way to make sure you have food on hand while keeping costs low is to buy in bulk. This works best with nonperishables and dry goods like organic popcorn, organic rolled oats, organic beans, organic flour, organic cane sugar, etc. We purchase 10 or 25 pound bags of these dry goods from a local organic farm for storage in our basement. It allows us to bake anytime without having to do the “can I borrow a cup of sugar” routine with the neighbors. I also keep an eye on our favorite foods in the grocery store and stock up whenever they go on sale. We know we will eventually need them and it’s best to pay the sale price. Note: A little preparation and planning allows you to shop your home for most things instead of having to go to the store every time you need something. If getting to the store is a problem for you, relax and let a grocery delivery program do all the work. Many services throughout the country deliver produce and other grocery items right to your front door. In the midwest Door to Door Organics is a popular home delivery service, offering mostly organic and local (when possible) produce. You have different delivery options (weekly or bi-weekly), and can customize what you receive; all made convenient with on-line ordering. Nothing like fresh organic produce delivered to your door in the middle of winter! Sit down for a few minutes before grocery shopping, making sure you have your calendar nearby. Look at the entire week ahead. Depending on what your week looks like, choose meals that can be prepared with the time available. Too busy for ANY cooking on some nights? Leftovers or frozen (homemade) entrees that can be thawed and warmed quickly are a great option. Use what you have on hand first (especially perishable items like produce). Record your meal ideas on your calendar, being specific about what you will eat each day. Make your grocery list, including any ingredients needed for the week’s meals. Try to stick to the menu so the temptation to eat out doesn’t arise! Keep a running grocery list in a highly visible place in the house to prevent running out of food staples. This is an absolute MUST in my house! We’ve all had the panicked moment when we THOUGHT we knew what was for dinner, but a main ingredient was missing. It’s too easy to give up right then and there and order takeout. Trying to compile the entire grocery list right before leaving for the store results in many forgotten items. Instead, I keep a magnetic pad of paper on the side of my refrigerator, and family members pencil in grocery items as they are running low. I like to be proactive so I already have a back-up when things run out. Think ahead, spend a little time, and surprise yourself by eating IN more this winter! Your health will improve, your food budget will shrink, and you’ll be better able to follow through on that New Year’s Resolution to lose weight and eat healthier. What tips do you have for making sure you’re not tempted to eat out during the winter? In the summer when I don’t have enough of any one vegetable to can, I mix what I do have and can that. It might be a handle of each green beans, tomatoes, zucchini, etc. in each jar. I call this soup. Then during the fall hunting and butchering season, I always can a few turns of meat and lots of broth. When we want a quick meal, I combine a jar of meat for a wonderful soup or stew. Another thing…as I’m emptying jars in the winter, I can dried beans. Cheaper than buying canned beans and handy for a quick chili or beans and rice meal. I don’t know why we never thought to can our dried beans! Great idea…we love having lots of beans available as a protein source!